Ronald Coopey (# 11 in the list of senior men to represent Great Britain) was born on the 9th April 1928. As a youngster he had lived through the war and shortly afterwards he was called to do his national service. This he spent in the Alpine regions of Austria and Italy where, naturally, learning to ski became a necessity. Coopey became very adept at skiing having been coached in the Alpine (downhill slalom) by an Austrian instructor and for Langlauf (cross-country) by a Norwegian instructor. His obvious, but albeit somewhat unexpected, skiing talents soon got him recognised to such an extent that he was knocking on the door of Olympic inclusion. In 1948 Coopey was faced with a decision. He was due for demob from the army but if he did so it would effectively mean leaving his skiing exploits behind him. He was now the rank of Corporal and as pointed out by his Commanding Officer he was also in line for promotion. The only drawback, as he saw it, was that he would have to do a further three years in the forces. After careful consideration Coopey decided that his future lay elsewhere and so he returned home. On his return Coopey was nothing less than super-fit. Cross-country skiing is widely recognised as one of the most extreme sports when it comes to fitness and for Coopey it have proved to be just that. Despite this, Coopey found himself at a loose end regarding physical activities and for a short period took up ice skating. This was to be short lived, though, having had his fair share of snow and ice to last him a lifetime. As luck would have it, his then girlfriend lived in Brixton near to the rink and so the couple went roller skating. It was around this time that Coopey got talking to a few speed skaters and very soon they had formed their own club - the Brixton Falcons. Straight away the club gathered members and grew quite rapidly. Coopey adapted his "Langlauf" technique for skating and being super-fit helped him rapidly rise through the ranks to become one of the country's elite speed skaters. On the back of this Coopey attended trials for the British speed skating team at Moorgate. His success was such that in 1951 he was selected alongside Don Brown and Dennis Hill to take part in that year's World Championships in Monfalcone, Italy. 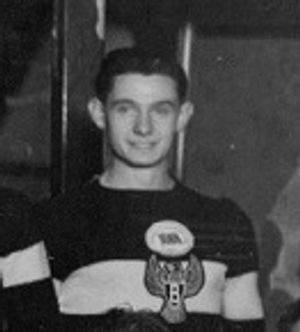 To put this into perspective, Coopey had arrived back in England having left the army in 1948, took up roller skating shortly after his return and had made such an impact that within 3 years he was a senior international skating for the well established British speed skating team in World Championships. Remarkable. Under the management of Joe Weatherburn, Coopey raced in all events. Only Denis Hill would get a medal at these Championships but Coopey put up a respectable performance showing that he was well worthy of his inclusion into the team. His style and technique, although different, worked extremely well for him. 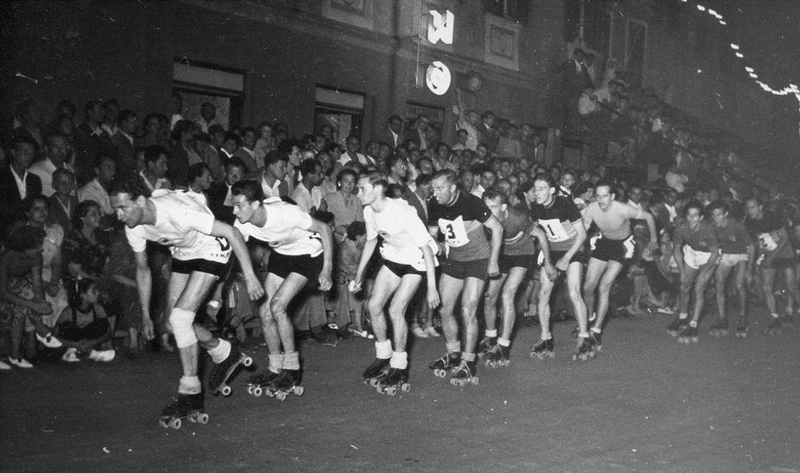 The 1952 World Championships, due to be held in Barcelona, Spain, were cancelled at short notice much to the disgust of other European nations. This obviously meant that Coopey would not be afforded the opportunity to better his international performances of the previous year. In fact, Coopey would not pull on a British shirt again. In 1953 his inclusion in the national team was overlooked in favour of British 5 Mile Champion Peter Wimble, a much improved Ken Rawlings, British team stalwart and World medallist Denis Hill and a 17 year old making a name for himself, Les Woodley. 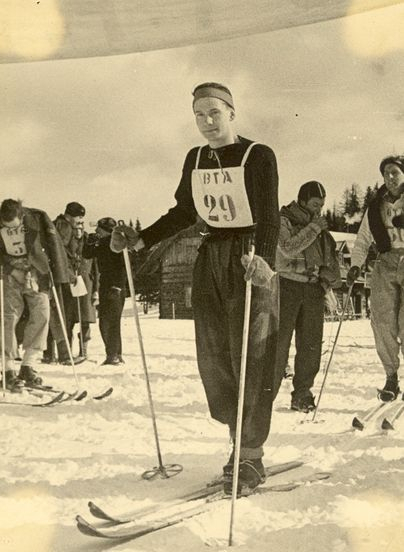 By 1954 it was evident to Coopey that the intense training he had undertaken for his skiing, coupled with that of his new sport, roller speed skating, was beginning to take its toll on him physically. Suffering from chronic knee pain, Coopey knew that even though he was just 26 years of age, his racing career was effectively over, certainly at the level to which he aspired. As he would later point out, "there were no new knees in those days". Despite his retirement from racing, Coopey didn't walk away from the sport. That year, Coopey married his girlfriend, Diane, that had introduced him to the sport and in fact, it was through his wife, who was also a keen speed skater, he put his efforts into coaching. When the Brixton rink closed the club effectively folded and its members joined other clubs around London. Coopey and his wife joined the North London Roller Speed Club, where Coopey could continue his coaching and provide advice to some of the skaters that would emerge as the British elite in later years - the likes of Bill Sharman and Pat Barnett to name just a few. History shows us that very few people start a sport from new and within two years find themselves not only amongst the world's best, but also being competitive. Whilst this profile is a dedication to Coopey's exploits as a speed skater we should not forget that he was a supreme athlete who was knocking on the door of Olympic stardom on skis before he chose eight wheels. We should also not forget that he was one of the founder members of the Brixton club who introduced us to the likes of John Folley, Bill Sharman and Johnny Ellis. For this alone he might be considered a "legend" within the sport. But the fact that he competed for just six years that included a spell with the British team and then went on to coach future champions himself, means that he is definitely considered a legend. 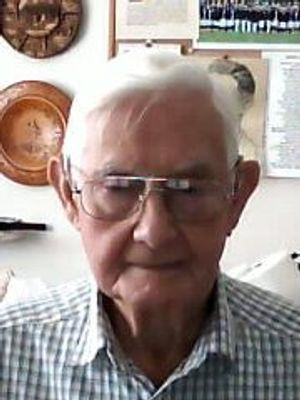 Sadly, Ron passed away in 2013 after a short illness, aged 85.